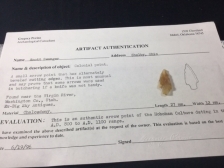 Dimensions:3 34" x 1 916"
Made of Dover Chert, this, just shy of 4", Kay Knife came out of the Townsend Collection and is from Tennessee. It looks like the knife had an impact fracture at some point. It continued to be used as a knife as evidenced by the rounded tip showing heavy use. It has Bennett's COA and I have the shipping. "A Flute Runs Through It"